In the previous chapter of DIP, we created and used abstraction to make the classes loosely coupled. Here, we are going to implement Dependency Injection and strategy pattern together to move the dependency object creation completely out of the class. This is our third step in making the classes completely loose coupled. Dependency Injection (DI) is a design pattern used to implement IoC where it allows creation of dependent objects outside of a class and provides those objects to a class through different ways. Using DI, we move the creation and binding of the dependent objects outside of the class that depends on it. Dependency Injection pattern involves 3 types of classes. Service Class: The service class (dependency) is a class that provides service to the client class. Injector Class: The injector class injects service class object into the client class. As you can see, injector class creates an object of service class, and injects that object to a client object. This way DI pattern separates the responsibility of creating an object of service class out of client class. As you have learned above, the injector class injects the service (dependency) to the client (dependent). The injector class injects dependencies broadly in three ways: through constructor, through property, or through method. Constructor Injection: In the constructor injection, injector supplies service (dependency) through the client class constructor. Property Injection: In property injection (aka Setter Injection), injector supplies dependency through a public property of the client class. 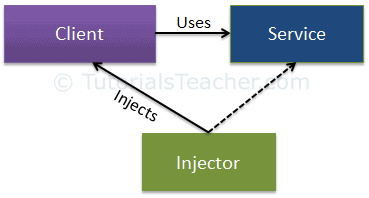 Method Injection: In this type of injection, client class implements an interface which declares method(s) to supply dependency and the injector uses this interface to supply dependency to the client class. Let's take an example from the previous chapter to maintain the continuity. In the previous section of DIP, we used Factory class inside CustomerBusinessLogic class to get an object of CustomerDataAccess object as shown below. The problem with the above example is that we used DataAccessFactory inside CustomerBusinessLogic class. So, suppose there is another implementation of ICustomerDataAccess for some reason and we want to use that new class inside CustomerBusinessLogic. Then, we need to change the source code of CustomerBusinessLogic class also. Dependency injection pattern solves this problem by injecting dependent objects via constructor, property, or interface. The following figure illustrates the DI pattern implementation for the above example. As you see, CustomerService class becomes injector class which sets an object of service class (CustomerDataAccess) to the client class (CustomerBusinessLogic) either through constructor, property, or method to achieve loose coupling. Let's explore each of these options. As mentioned before, when we provide dependency through the constructor then it's constructor injection. Consider the following example where we have implemented DI using constructor. In the above example, CustomerBusinessLogic includes constructor with one parameter of type ICustomerDataAccess. Now, the calling class must inject an object of ICustomerDataAccess. As you can see in the above example, CustomerService class creates and injects CustomerDataAccess object into CustomerBusinessLogic class. Thus, CustomerBusinessLogic class need not create an object of CustomerDataAccess using new keyword or using factory class. The calling class (CustomerService) creates and sets appropriate DataAccess class to the CustomerBusinessLogic class. This way CustomerBusinessLogic and CustomerDataAccess class become more loosely coupled classes. In the property injection, dependency is provided through public property. Consider the following example. As you can see above, the CustomerBusinessLogic class includes public property named DataAccess where you set an instance of a class that has implanted ICustomerDataAccess. So, CustomerService class creates and sets CustomerDataAccess class using this public property. In the method injection, dependencies are provided through methods. This method can be a class method or interface method. The following example demonstrates method injection using interface based method. In the above example, CustomerBusinessLogic class implements IDataAccessDependency interface which includes method SetDependency. So the injector class (CustomerService) will now use this method to inject dependent class (CustomerDataAccess) to the client class. Thus, you can use DI and strategy pattern to create loose coupled classes. So far, we have used couple of principles and patterns to achieve loosely coupled classes. In professional projects, there would be many dependent classes and implementing these patterns would be time consuming. Here IoC Container (aka DI container) helps us. Learn about IoC Container in the next chapter.